This NASA Hubble Space Telescope pair of images of Jupiter's volcanic moon Io shows the surprising emergence of a 200-mile diameter large yellowish-white feature near the center of the moon's disk (photo on the right). This is a more dramatic change in 16 months than any seen over the previous 15 years, say researchers. They suggest the spot may be a new class of transient feature on the moon. 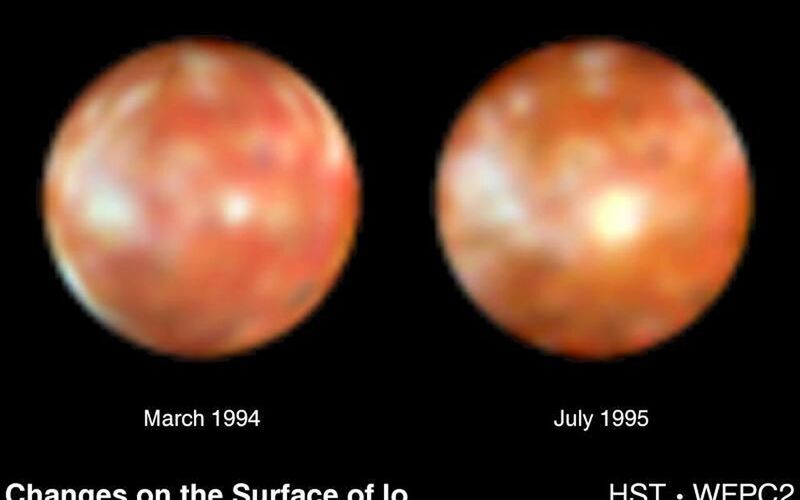 For comparison the photo on the left was taken in March 1994 -- before the spot emerged - - and shows that Io's surface had undergone only subtle changes since it was last seen close-up by the Voyager 2 probe in 1979. The new spot seen in the July 1995 Hubble image replaces a smaller whitish spot seen in about the same place in the March 1994 image. 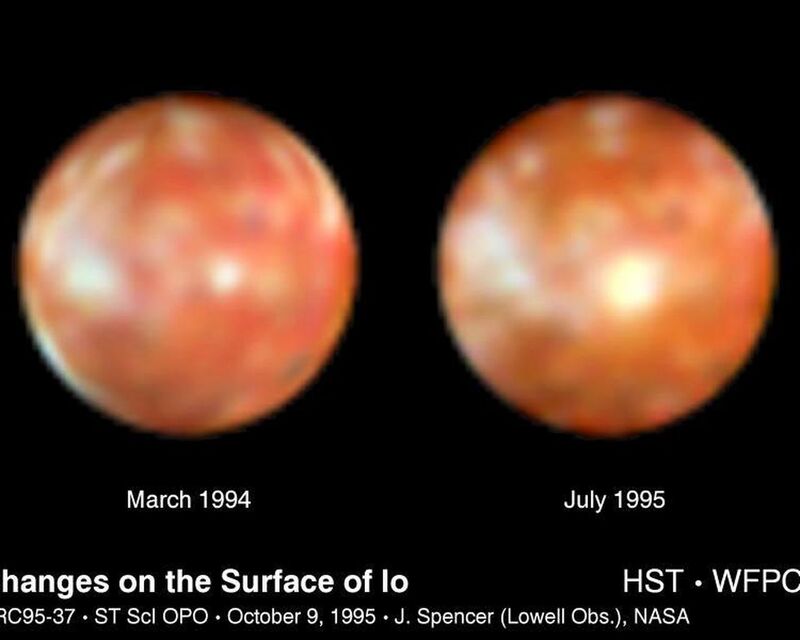 Note the much more subtle changes seen elsewhere on this face of Io over the 16 months between the images. Each image is a composite of frames taken at near-ultraviolet, violet, and yellow wavelengths, with Hubble's Wide Field and Planetary Camera 2. "The new spot surrounds the volcano Ra Patera, which was photographed by Voyager, and is probably composed of material, probably frozen gas, ejected from Ra Patera by a large volcanic explosion or fresh lava flows...," according to John Spencer of Lowell Observatory in Flagstaff, Arizona. The new bright spot is also unusual because it is much yellower than other bright regions of Io, which are whitish in color. The unusual color may result from the freshness of the deposit and will probably provide clues as to the composition of new volcanic materials on Io. The temperature on Io's surface is about -150 degrees Celsius (-238 degrees Fahrenheit); however, "hot spots" associated with volcanic activity may be as warm as 1,000 degrees Celsius (1,800 degrees Fahrenheit). 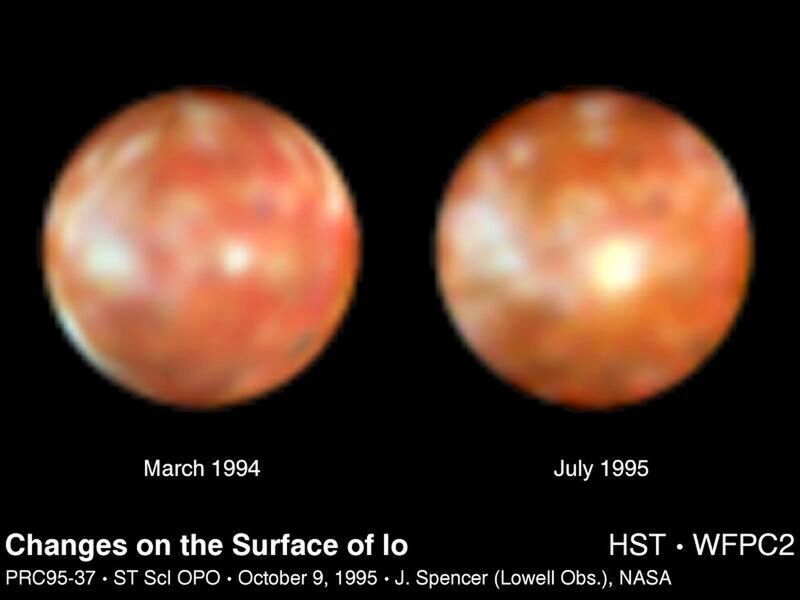 Follow-up observations by Hubble, in coordination with the Galileo spacecraft, scheduled to arrive at Jupiter and fly by Io in December 1995, will reveal the evolution and lifetime of the new feature. Galileo will be able to see much greater detail on Io in visible light, but will still rely on information gleaned from Hubble UV observations and Hubble observations taken at times when Galileo cannot observe Io. These further observations should also tell whether astronomers have witnessed, for the first time, one of the processes which creates the bright regions on Io.